so many beautiful stuff i want to get. sometimes i wish i could buy everything but since i’m not really working right now i don’t have much money to treat me with something nice. i want to be perfectly prepared for my final exams and working till night, as i did last year, doens’t really fit with that. 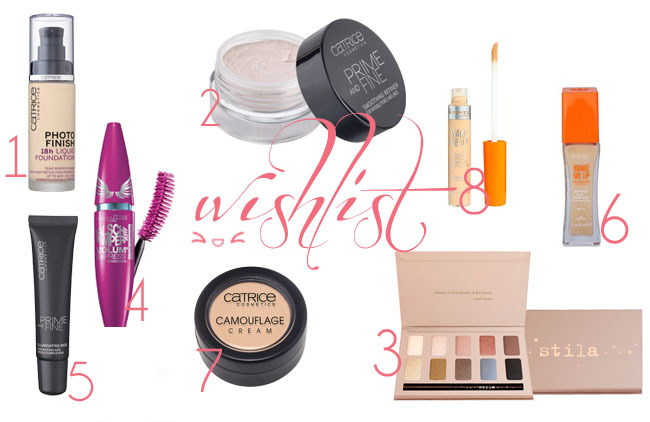 anyway, here’s a wishlist for beauty products i really want to purchase in the next month or so. catrice really is one of my favourite german drugstore brands since their products work prefectly fine without being a huge investment. this foundation is right at the top of my catrice withlist. it seems to be a full coverage foundation and i hope they have a light shade which fits my skin tone but really want to buy this one as soon as possible. i’ve been looking for a good and cheap face primer for ages and since catrice products are high quality for their prices i can’t wait to try their primer. its oil free and should give a smoother feeling to the skin plus it makes the skin looking even better. the main thing is, off course, making the make up last longer, which it promises. so many blogger and youtuber raved about this palette. a eyeshadow palette with fairly neutral shades which are the ones i prefer to wear on my lid. i only read positive reviews about this one and the price i good for what’s been told about it and what it promises. highly pigmented eyeshadows and a free eyeliner. since i can’t purchase stila products in stores in germany i’m really glad ASOS sells them. maybelline mascaras have been my first ones and i have no idea why i stopped testing them. this one caught my attention last time i went to the drugstore. since tanys burr(her blog) loves her maybelline mascara i really can’t wait to get me one and i really love what she says about certain products and realyl trust her opinion. i can’t wait to get my hands on this little baby. oh yes, another face primer.this one will give a more glowy finish to the skin. something i really want for an everyday look. as i mentioned above, catrice really i an awesome drugstore brand and i’m really picky with those. i have no idea where rimmel products went in german drugstores. they are just gone. which is really sad. nearly every single youtuber i like to watch all day seem to love this foundation alot and i really want to try it and see if it works also for me. i’m so glad that ASOS sells rimmel products and gives me easy access to it. i feel like this product is right at the top of my wishlist. i’m huntig for products that help me covering my undereye circles and all the little spots that keep my skin from looking good. camouflages give a higher coverage than concealers normally do and they have a thicker consistency. i hope it gives me the coverage i need. i was like,if i get the foundation, i need to get the concealer also. that why this concealer is on my wishlist. eventhough if i’m not quite sure if i really get it as soon as the foundation. have you guys used one of these products above? tell me if you liked them and i really want to know wether you have a wishlist right now or you just purchased a product on your wishlist. i really want to know which products make you want to spend your money all at one time. so i’m off to my bathroom.i’m out for a dinner tonight and need to,finally, take a shower. have a lovely day. "head up and heart strong"